Did you have a crabgrass problem last year? Well, chances are, it’s gonna be even worse this year! Crabgrass is an annual lawn weed that dies once a hard frost hits. The main problem with this pest is the tenacious seed that it leaves behind after it blooms. Apply the pre-emergent as the forsythia is going out of bloom. For newly seeded lawns, wait until you have mowed your lawn three times before applying the herbicide. This will help to avoid killing the new grass. 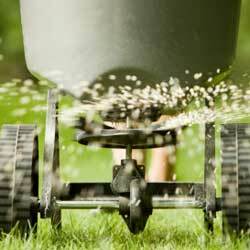 Use a spreader to apply the herbicide uniformly across your lawn. Apply your pre-emergent before a light rain. This will knock the chemical off the grass blades and down to the soil surface where the crabgrass seed is germinating. Do not de-thatch or aerate the lawn after applying the herbicide, as this disruption will break the chemical barrier. Wait two to four months to re-seed the lawn after applying. Repeat this same procedure year after year. Keep you and your lawn safe. Always follow the manufacturers’ instructions. This entry was posted in Early Spring, What's Bugging You on March 28, 2018 by admin. © 2019 Chestnut Hill Nursery. All rights reserved.